Hi! So, I guess I made another contest. This one is a bit unconventional, and I'm not sure if you guys will enjoy it, but I hope you like it! Sorry about the long description, by the way. - Create a character with some sort of backstory. 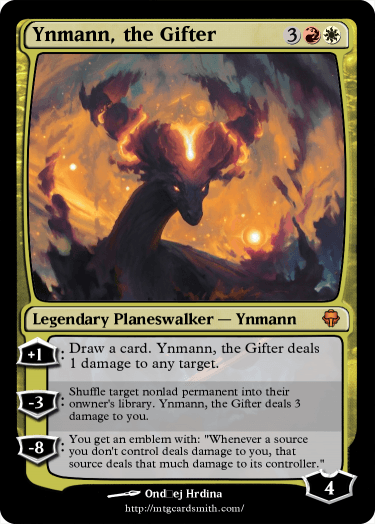 It could be a planeswalker or legendary creature. - Write up a backstory for them. It could just be a description of their history and personality. It could be a couple paragraphs written in the voice of your character, something written by the character, or anything else you can think of. 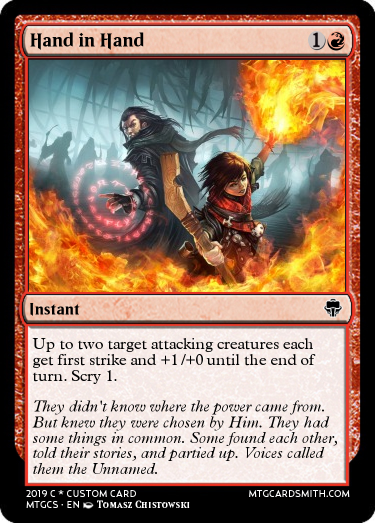 You can also hint at some of their backstory through the cards/flavor text (in addition to the written backstory). - No more than one character per person. - Deadline is on April 20th. Feel free to ping me if I'm late with the results. - Entries are judged mainly on the characters rather than the actual cards. Which I know is a bit weird. - Judging is based on the characters' memorability and complexity, as well as how distinct their personality and voice are. 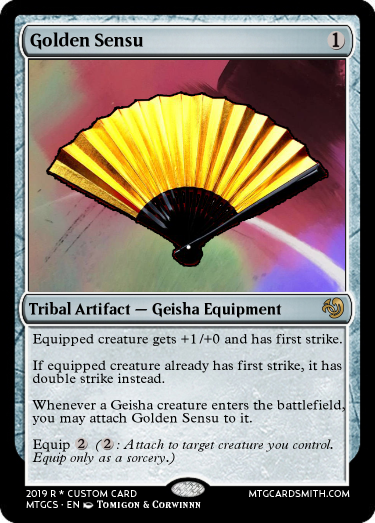 Card balance, creativity, and aesthetics are also taken into account. First place gets 4 faves of their choice and a follow. Second gets 3 faves and a follow. Third gets 2 faves and a follow. "Hello, darling. My name is Cameron. Cameron Lovelace. I'm afraid I don't have time to tell you my tale in full, but I can tell you the most interesting bits. Shall I tell you of the time I defeated the great Eldrazi Titans? Or how I single-handedly stopped a dragon from ascending to godhood? Or the time I... You look bored, darling. Oh dear, I'm rambling again, aren't I? Why don't you tell me about something more interesting? Like, for instance, yourself. Wait, where are you going?" So yeah. 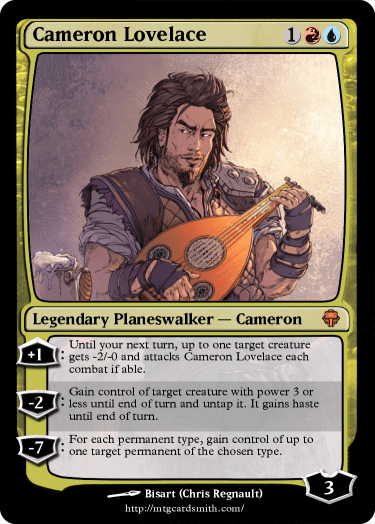 He's a bard who's also a planeswalker. When he inevitably gets himself into trouble on one plane, he moves on to the next, and never looks back. Good luck, and happy smithing! In that case, please meet Sephina. 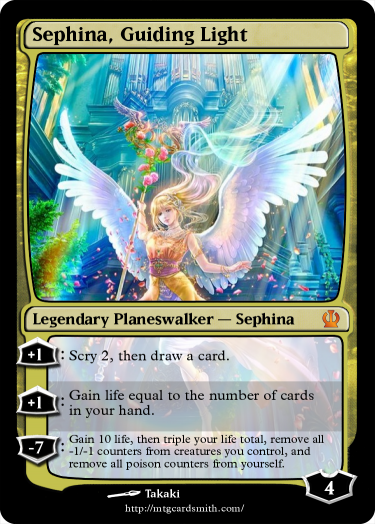 Sephina is an Angel of Innistrad, created by Sorin and the youngest sister of Avacyn, Gisela, Bruna, and Sigarda. During the war with Griselbrand, Sephina was too young, and too weak, to assist her sisters in battle. 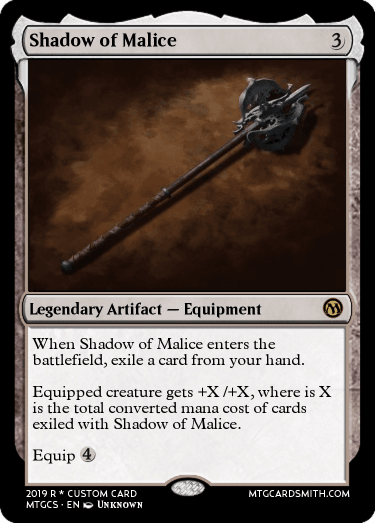 As such, when Griselbrand, along with Avacyn and her sisters, was imprisoned in the Helvault, she was spared. 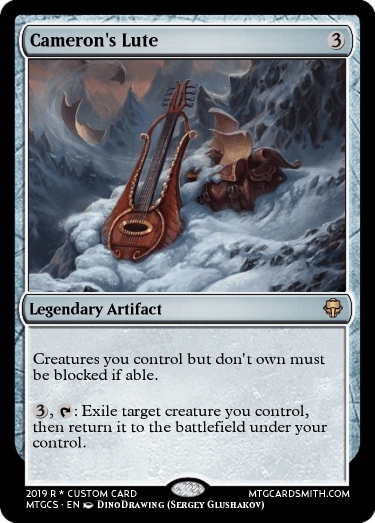 She misses her sisters dearly, but had hoped that without Griselbrand, Innistrad would be able to achieve peace. Her hopes were shattered however as vampires and werewolves slowly took claim of the plane, and humans lived in a constant state of fear. She knew that this situation was not tenable, and she couldn't allow things to remain as they were. However, though stronger than she once was, she was not powerful enough to save the humans on her own, or with the few angels left. Sephina determined that the only way to save the humans was to free her sisters, but she was unable to do so herself. She only knew of one person who could. 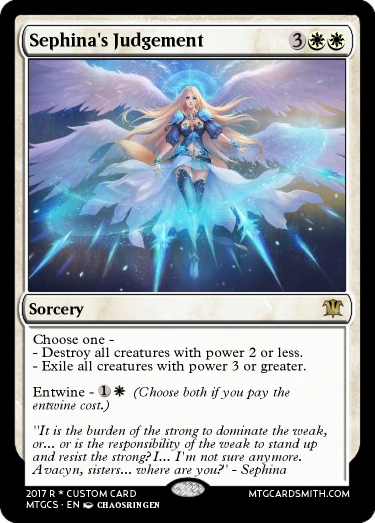 Her creator, and Lord of Innistrad, Sorin Markov. However, she had no way to reach him. She immediately put herself to study, and worked to discover everything she could about her creator, and where he was. Her search led her Ludevic, one of the most respected, and feared, scientists on Innistrad. His crazed and insane works repulsed her, but after reviewing the documentation she had discovered, he was convinced he could artificially create in her the spark required to travel the planes. She agreed to submit to his experiment. It was painful. That is all she remembers of what Ludevic did to her. It was so painful, she was sure she cried for death. But after seven days, the pain stopped, and she felt whole again... and something else. Ludevic had succeeded, mostly. She was still her, still an angel, and so she promised him a boon for his service, and immediately leapt to a new plane to find Sorin. 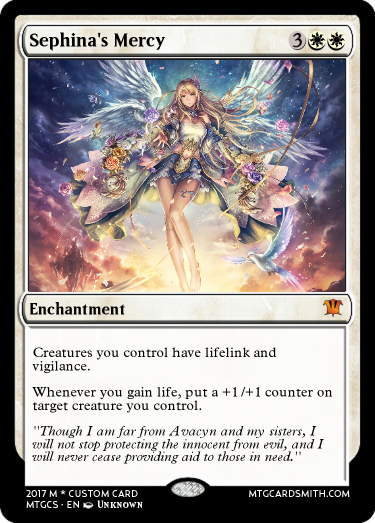 However, a novice with her powers, and unnaturally gifted to her, she was unable to direct her course, and found herself randomly sent from plane to plane, most recently landing on the city plane of Ravnica. Lost in the giant city, she is unsure where to go or what to do to find Sorin, especially as she still cannot select her destination. 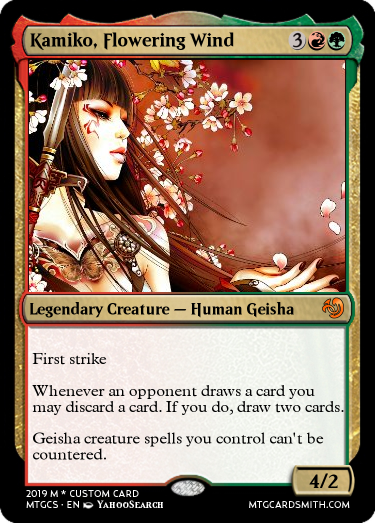 However, she does see one similarity to Innistrad. Suffering. She is an angel, and a protector of those in need to saving. 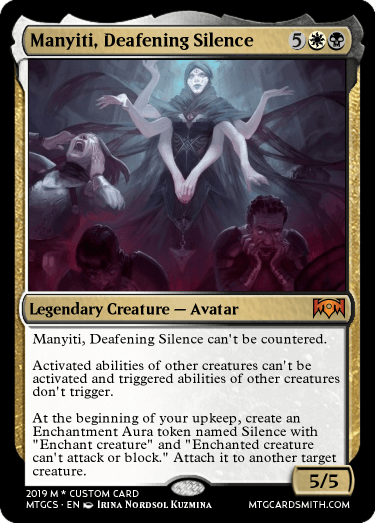 She knows her quest compels her to move on and find her creator, but the people of Ravnica are in pain, and she cannot understand why the Angels of Orzhov and Boros do nothing to help them. 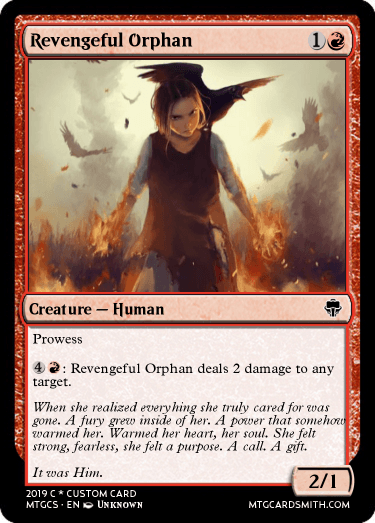 She will eventually move on, but first she wants to learn, possibly teach, and try to bring hope to Ravnica. I'll try to come up with a 7th card for her for this contest (not including the two tokens I didn't post here). 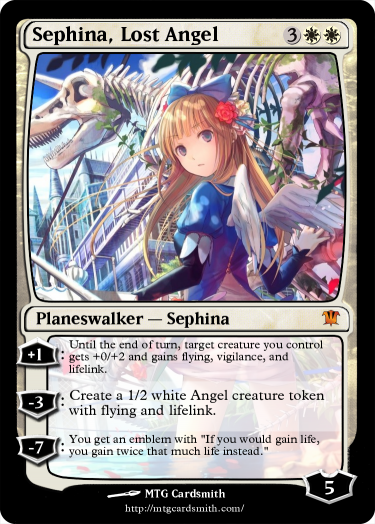 For reference, the first card is Sephina before she first travels across the planes. 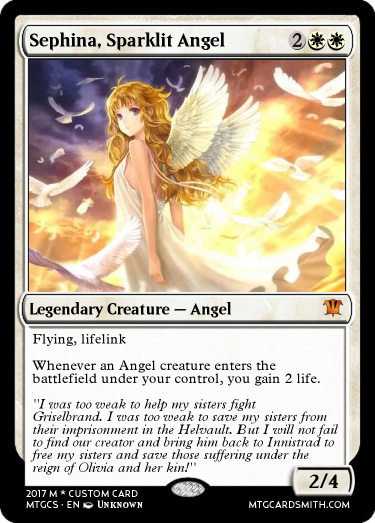 Second, is Sephina as an angel lost on Ravnica. 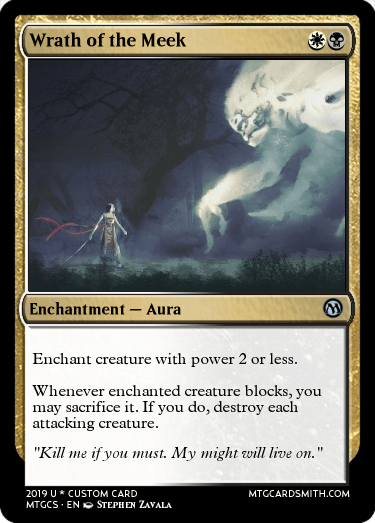 The enchantment is Sephina's desire to protect all those around her, while the sorcery is Sephina's confusion as to whether or not the angels of Ravnica have it correct, and that they should dominate those below them to create order (or whether she should protect the weak from those in power). 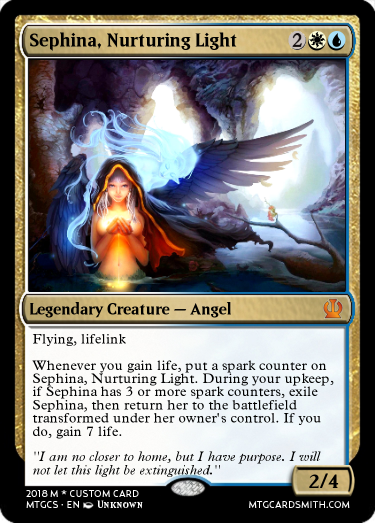 The final transform card is Sephina re-affirming her resolve to help those without the power to help themselves. Manyiti was once a young girl in a small village about 140 miles from the small city of Kuguv. She lived a tough life; her village was distant from any sort of interaction with any major cities, so she knew only those in her village, and a few poor merchants who traveled through it attempting to make a fortune. She often imagined travelling with one of the merchants just to see anything other than small hovel of about a dozen buildings which she knew as home. Her village, and the surrounding villages, did their fair share of farming. But they were also the place of a dark secret. Far past Kuguv, which was an independent merchant city considered itself to be on the fringes, was a vast empire known as Iumra. Iumra had been embroiled in a war with several other great vast empires for hundreds of years. Many considered Iumra to be the herald of justice; an empire that fought to reclaim lands from tyrannical empires and to restore peace and unity among the lands. This wasn't at all known to Manyiti or her village. But far away, Iumra fought its holy war to end strife. In Manyiti's village, all that was known, was that when you plow the fields, be careful of snags. If your plow snags, move around it because you don't want to know what's beneath it. Manyiti had been told this all her life. Hit a snag underground, and move on. One day, when she was about ten years old, she was playing with the only other child in the village, a boy named Nime, at the edge of the fields. She was chasing Nime in their favorite game, the runaway thief, where Manyiti was a traveling merchant and Nime was a thief who had stolen some of her wares. As she was chasing him, Nime tripped. As she got close, Manyiti in fact realized that the ground had given out, and Nime's right leg, up through half of his thigh, was in the ground. Nime quickly pushed his way out, and took off again, laughing and jesting that Manyiti could not catch him. But Manyiti didn't care about the game anymore. All she wanted to do was scream, but whatever in her wanted to was completely silent. The blood in her head was throbbing so loud but she could not utter a word. She just simply stared into the hole where Nime's leg had just been, at the decaying face of a person. The face, though marred, still had remnants of recently dead flesh, and the eyes, while vacant, looked like they had only begun their descent back to soil. Manyiti was not foreign to death. Her grandmother died when she was eight. But they had burned her corpse, like everyone else who died, in a ritual to remember that all people come from both earth and air. That when people die, they must be both returned to their earthen parts (their ashes) and their air parts (their breath). If this is not so, the body becomes a vestige for curses and becomes something most unholy. This body was neither returned to dust nor air. Manyiti ran home, her voice still silent, Nime chasing after her. Nime did not know what had happened, for he had not chanced to look again. She burst through her door and and crossed the threshold, her words still gone. Her parents, young, but their faces worn, saw their child with her voice silent and knew what had happened. You always move around a snag. That was Manyiti's first entrance into the reality of her village. That for some reason, bodies appeared under the soil in bounteous numbers. She questioned her village why they did not burn them and return them to air and earth. The only response she was given was "because even more would reappear to replace them." Manyiti fled her village at the first chance she got. A somewhat affluent merchant traveled through her village when she was seventeen, and she stowed herself away in one of the merchants' caravan's barrels and was whisked away to Kuguv. There, she found the plight she sought to flee, the bodies buried beneath the soil, was not gone. She found decrepit hands poking through the cobbles, the tips of skeletal bones peaking out of the walls. Kuguv, the city of corpses. Not anything she had imagined it to be. She thought Kuguv would be a bright, cheery city with beautiful trees and wonderful festivals. Instead it was a city of wreathes of bones and a strict policy that one shall not disturb the protruding remains of any dead, for that shall only bring more. She began to think intensely on this. If they were corpses, they had to come from somewhere. She could avoid people's suspicions that touching a body caused more to appear. But she could not accept that they appeared from nowhere. She sought answers of where the most dead died. No one would talk to her. Until she met her. She wasn't superstitious about the bodies; in fact, she was enthralled by them. Every day, Manyiti watched as the curious hooded stranger scribbled beautiful words into crisp, golden scrolls. She endeavored to meet the stranger. She was surprised to find the stranger was not human. She called herself a moonfolk, from a distant world. It didn't make much sense to Manyiti, but if it could give her clarity to her problem, she would accept it. She said her name was Tamiyo. The moonfolk instantly became intrigued that Manyiti too was curious about the dead. Manyiti said that everyone else she ever knew had thought the dead simply appeared, but she knew the dead had to come from somewhere. The moonfolk simply replied "clever" and a scroll floated to her side and a quill began to scribble on its own. Manyiti went to ask how, but Tamiyo interrupted her and said that they must go. Feeling that her time in Kuguv was worthless, Manyiti followed the moonfolk. Tamiyo wished only to take in the most that she could from the girl. They traveled East, discussing the bodies and creating theories. Until one evening. They stumbled upon the still blazing field where a battle had just finished. Manyiti knew nothing of what happened, but Tamiyo, whispered something that Manyiti could not understand. But as they watched closely, a few cloaked individuals scoured the battlefield, and upon finding a dead body, enveloped it in a small black bubble, and when the bubble vanished, so had the body. Manyiti rushed across the field, enraged that these people were doing such strange things. Her mind had already pieced it together. People had been sending their dead to the fringes. As she approached the cloaked men, they turned to her, and she saw the fear in their eyes. They stepped back, but no words came. Manyiti knew what it was. The Silence. An instant where your mind is so filled with terror and horror that no matter how much you wanted to, you could not utter a word, nor move your body. She reached out with her mind. These men were mages. If she could tap into the Silence within herself, maybe she could tap into theirs. She connected. She could feel their Silence, but it was not like hers. She could control it. She was not partaken to it. She could dominate it. And so she made it erupt inside them. A Silence so great that their minds could not think and they could not breathe. And they collapsed before her. She turned back towards Tamiyo. The moonfolk was scribbling something on a scroll quickly with a worried face, then vanished from the hill. Manyiti pressed on. She honed her skills. And she arrived in Bulmaduj, capital of Iumra, the empire that transported dead hundreds of miles away so they would have to deal with it. And she took the first ritual of the Silence. 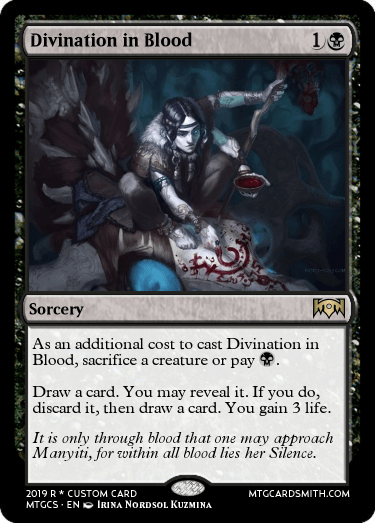 With the blood of one of the high officials, she entered the first phase of Silence, she honed her mind such that the Silence was not only a part of her, it was her. That in the moments when Silence would take hold it could not because it always was, to some degree, in control. She could never abandon the sights she had seen as a child. She would always have the Silence for that. She ravaged Bulmaduj. At first she was whispers. Everyone's worst fears. Some died of their own accord. And then she became more. And she grew on the fears and the Silence of those who had succumbed across the city. She grew to the point of ascension, and she moved beyond her body. Rather, she discarded it. She didn't want it anymore. She was the Silence as much as the Silence was her. As her new form, she finished the city. No one survived. Its citizens descended into unspeakable madness so wrought that they could not help themselves. She left, but she is never gone. She is in your head ever time the breath leaves your lungs and you can't speak a word. Every moment when you wish you could move, she is there. Few can control the Silence within themselves; wrest it out of the hands of Manyiti. But it is not impossible. Walk the path of blood that she had, and the Silent whispers fade into nothingness. Sadly, I don't really have enough entries to properly judge them all. So, I am extending the deadline to the 27th. I'll work something out if no one else posts. Don't forget to bump your contest if you notice a large gap of activity in it. Lots of people don't read to far into the forum posts, so if it isn't on the first or second page when they look, it disappears. Also, to be honest, this is a grand endeavour for people to create, so one week is a rather short time frame. Not to mention it fell right around Easter for a lot of people. Busy time. 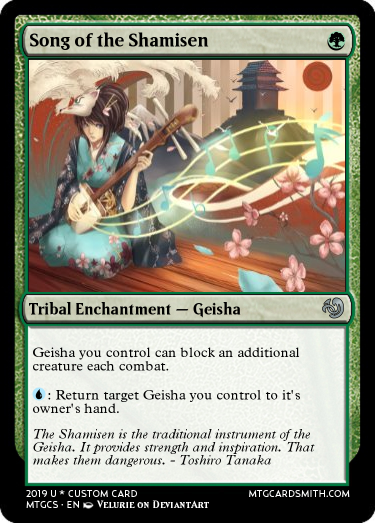 Forget what you think you know about Geisha... On Pandemonium they are more than just pretty ladies who can play music and act... They're the deadliest entertainment around! I'm interested in entering as well. I will be working in the cards in the following days. I'm going to submit a Dungeons & Dragons character a friend if mine plays that I find particularly compelling. The story will just be a summary of the character's history. For those of you unfamiliar with D&D, it is a game about communal storytelling set in a fantasy world designed by a person called the game master. The game master can make up anything they want, but they also have a fleshed out world available to them, where they can lead adventures. Zyn's story starts in that world, Faerun. In Faerun there is a species (or race in D&D terms) of elf called Drow. They used to live on the surface of the world, until their goddess, Lolth, angered the other elf gods. The drow were then exiled to a place called the underdark. The underdark is the subteranean counterpart to the surface, full of winding tunnels, ravines, dungeons, cities, and remains of civilizations past. As the draw grew acoustomed to living in the underdark, they developed their own culture separate from the surface elves. Drow society is founded on a caste system. At the bottom are slaves, and at the top are the religious leaders and matriarchs. In all tiers, women rank higher than men, who are regarded as little more than mindless animals, excluding the exceptional few. However, even the women have to be on their guard at all times, as assassinations caused by milliniea-long grudges can spark huge family wars. This is the world that Zyn was born into. Zyn had a fairly normal childhood by drow standards. Her mother was a low-ranking priestess, and her father was a member of the guard. once Zyn reached her teens (around 70ish in human years) however, something unusual happened. At that point, Zyn realized that they were gender-fluid. Sometimes, they would identify as male, and other times, they would identify as female. From that point on, they insisted on treating males around them as equal to the women. This obviously caused some concern among the matriarchs and priestesses, but they were willing to let it slide until one fateful day. Once Zyn hit about 100 or so, their father was caught disrespecting the goddess Lolth. As per law, he was to executed. During the execution, Zyn attacked their mother and freed their father. Their father managed to get away, but Zyn was apprended. As a sentence, Zyn was banished from the territory, and told to go kill a vampire several miles away. 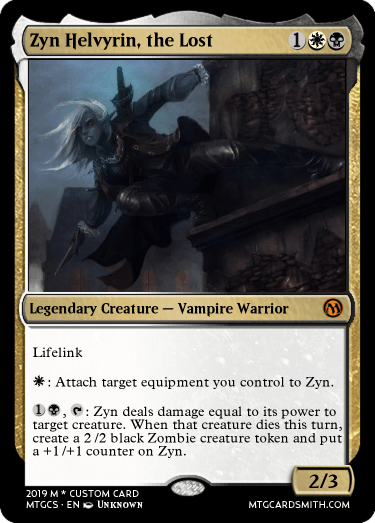 Since Zyn wasn't a particularly gifted fighter, and they hadn't bothered to learn magic, this was tantamount to a death sentence. Suffice to say, the vampire easily overwhelmed Zyn, and Zen was Vampirized. After about 50 years, the vampire got bored of Zyn's presence, and kicked them out. Zyn then decided that they had enough of the underdark and Lolth. Zyn made a pact with the Raven Queen (A fallen elf who controls an entire plane of shadow), and made their way to the surface. Once on the surface, Zyn spent a few hundred years away from society in general, before co-founding a town named Aliceton. After this much time, Zyn has become a weapons master, and the power of the Raven Queen allows Zyn to summon shadowy replicas of weapons. Fear was such a human emotion. Sorin had not felt true fear for a very long time indeed. Certainly, he had experienced a vague tingling in his spine, a tightening around his eyes and quickening in his chest. His vampire body had tried its very hardest to replicate the panic that it had once experienced when it had been mortal- yet somehow, it always failed to hit its mark. Now, however, he could feel it again. It was a choking weight within him- wrapping itself around his quickly beating heart. He really hadn't missed it. "So it begins," the creature leaning against the wall murmured, "the fall of Ravnica and the start of a new world order." 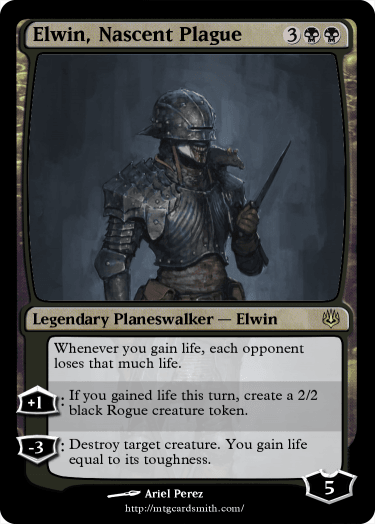 "You're a planeswalker," Sorin spoke quickly- trying to inject his voice with a confidence he didn't have, "and a vampire, like me. We can work together." "You're not a vampire," the thing spat. It slid off the wall and stepped closer to Sorin, "you're too human- barely even immortal." Sorin tried to move. Something stopped him- filling his limbs with a leaden weight and sealing him in place. "A vampire is the opposite of life," the creature hissed, "it is undeath- an absence. A void. Free from the petty squabbles and desires of humanity. Free from purpose. A vampire need not think- it need only hunger." "A delightful speech," murmured Sorin, "but it means nothing. You can't just feast your way across the multiverse- you're clearly young. Time will tell you that there's more to life." "I am not life," said the thing. "What's your name?" Sorin asked. 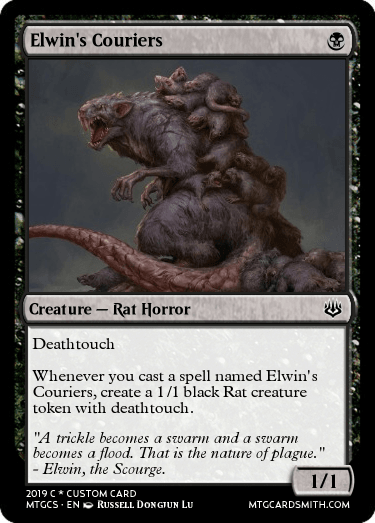 "Elwin," the creature was close now. Sorin could hear its breath, ragged and sharp. "Elwin," Sorin said, "what are you going to do to me, then? You can't exactly drink my blood." "No," it replied, "but I will drink your memory of this conversation. 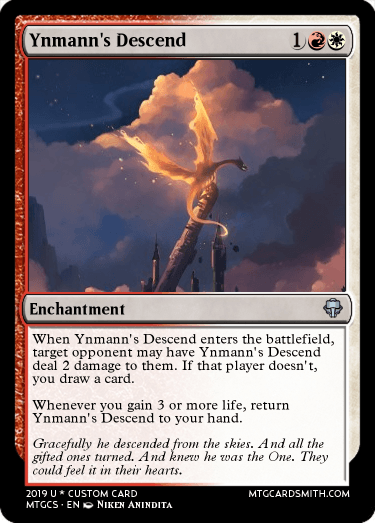 Just as I will drink the memories of every planeswalker on this plane." Sorin could see it now. There was a feeling of wrongness around the vampire- as though even the air itself was horrified of it. The closer it got, the weaker his limbs became. "Though not before I take something a little more tangible," Elwin said. It reached up and, with a sharp tug, pulled out a lock of Sorin's hair. The vampire barely felt it. His head was swimming. 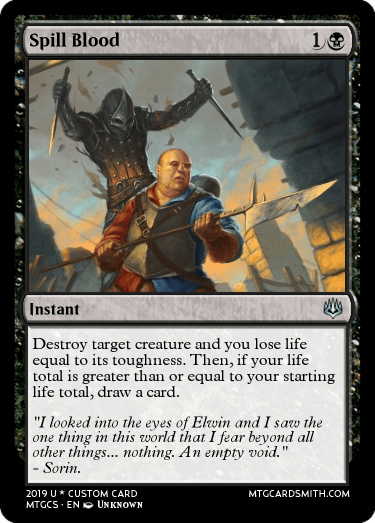 "It will not be today," Elwin wrapped the lock around its finger and turned away, "it will not be tomorrow, but there will be a time when there will be no more life, Sorin. Stop clinging so tightly to it and you might just see the end coming before it's too late." Sorin opened his mouth to say something, and then darkness rushed up and took him. His last sight was Elwin, walking away down the alley. On either side, shadows detached themselves from the darkness and followed him, knives glinting in their hands. The floor seemed to writhe beneath them as they went: thousands of rats following the vampire as it walked away. 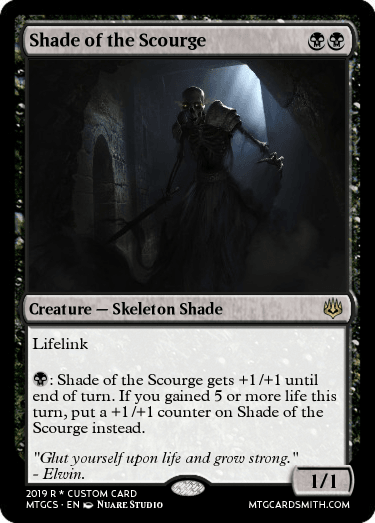 As he surrendered to darkness, Sorin's heart quailed. A dark-robed figure was currently sitting in an obsidian, ornated throne. The figure can be described as a man in his old times due to his long white beard and half-bald head. In his right hand, multiple imagery could be seen flashing in a scrying ball he was holding for an unknown amount of time. "So, the dragon is locked away in his own realm..."
A moment afterwards, another unknown creature was slowly creeping inside the dimly lit room, the said figure was an amorphous mass of black tendrils that slowly transformed itself into a hooded person, with half of his face hidden beneath his hood. "The threats are gone. So is with the Immortal Sun." Reported the person who was currently standing a few meters away in front of the old man. "Ah, Mr. Lazav. That wasn't so hard, wasn't it?" Commented the old man as he also unsummoned his crystal ball. "Don't forget about our bargain, Malachai." The old man just smirked behind his greyed beard as he summoned a hand-sized glass tube with a glowing orb inside of it. The tube then slowly floated away towards the standing person as he finally caught it with his right hand. "Pray tell, do I detect envy behind that stoic visage of yours?" Asked the old man with a condescending tone. "..." The hooded person said nothing as he turned his back. "I know, this isn't my business to mess around with this little world of yours, nor even I have the desire to conquer this place. But to be confined within this space, within this small world, when you know that people like me could just come and go whenever they want, it is so... claustrophobic, doesn't it?" "You cannot win against us all anyway." 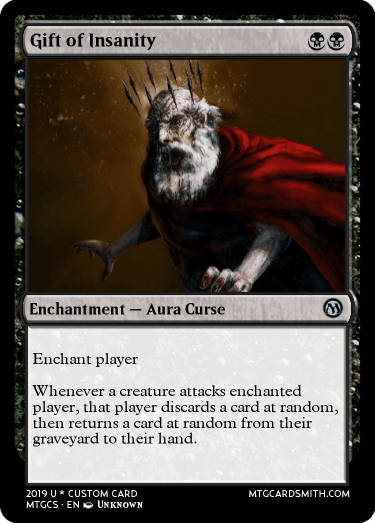 The Dimir guildmaster just slightly turned his head on the left. "I know my limit, Mr. Lazav." Remarked the old man as he stood and summoned another item that looked like an ordinary wooden walking staff that was crudely shaped although the power that it emanated could be felt across the room. "If you're finally done with your little research, and if you somehow finally able to walk between the worlds, you will know that there are many places out there that are worth to be... controlled. And after all my years, I know that this is only the beginning of my journey, Mr. Lazav. And maybe we will see us again in a... better circumstance." 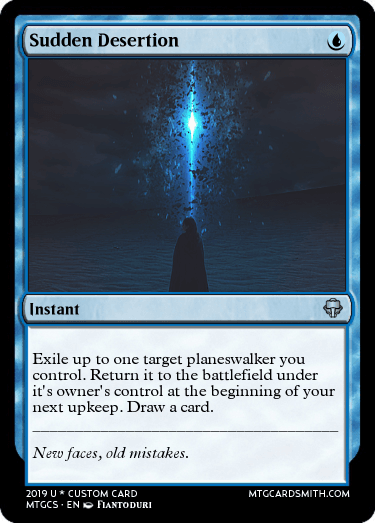 Suddenly, a spatial rift appeared directly behind him as the old man slowly walked towards it, then suddenly disappeared along with the rift, leaving the Dimir guildmaster alone in the dimly lit room. The Dimir mastermind could only frown and silently left the room towards the street above that was crowded by people due to a celebration of the victory against the otherworldly invaders moments ago. Let me tell you of a tale as old as time. There was a time when darkness and light fought eachother, one moment one would win and there was light. Humans called it day, and one moment when darkness would win, humans called it night. Darkness and Light created each a being that would reign during their prime, and a third one that would reign during transitions, Ynmann. Ynmann grew up without a true parent, no dark side, or light side. So he grew closer to Earth and the physical realm overall. Learned from nature, human behaviour, justice, morality, and therefore developed emotions. Ynmann deceided to put an end to the endless war between Light and Darkness. But he couldn't do it alone, so at dawn, when he was the most powerful, he chose a human. One he thought had courage to fight by his side when the time had come. As time passed, he started building an army, the Unnamed. An army of faceless heroes that didn't know their purpose yet, but were up for the biggest adventure of their life.